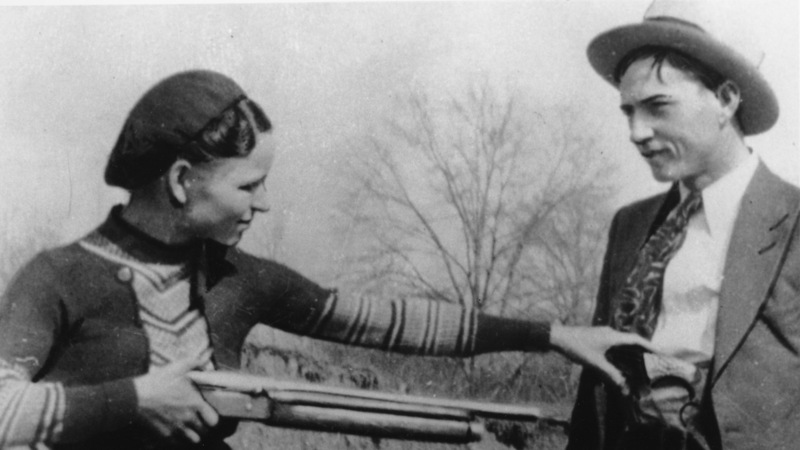 In between robbing banks, fleeing the law and killing, Bonnie and Clyde had a hobby: poetry. You've read the story of Jesse James Of how he lived and died If you're still in need of something to read Here's the story of Bonnie and Clyde. Now Bonnie and Clyde are the Barrow Gang, I'm sure you all have read how they rob and steal and those who squeal are usually found dying or dead. Some day they'll go down together And they'll bury them side by side To few it'll be grief, to the law a relief But it's death for Bonnie and Clyde. These stanzas, penned while the duo was on run, are in a collection of Bonnie and Clyde poems that will be auctioned off by Heritage Auctions in Dallas on May 4, along with a notebook and some photos. It was no secret in the 1930s that Bonnie wrote poetry — some of her poems made it to print. Her poetic ways were even featured in the 1967 movie Bonnie and Clyde when Faye Dunaway recited Bonnie's lines. Now that's not as good as Bonnie's so I guess I will call it a flop but please God just one moore visit before we are put on the spot. Both of their poems have the same themes, according to Don Ackerman, the consignment director for Heritage Auctions. "They're trying to justify their existence," Ackerman told NPR's Scott Simon. "They're saying that they're getting bad press — that they're really not that bad." For example, Clyde writes, if they're tying someone up to a tree, they would be careful to tie them up "not so tight that after we were gone, they could not get themself free." Clyde's spelling and grammar skills weren't always very strong. Later in the poem, he writes, "We have never shot at annyone that wasent after us." Bonnie and Clyde's poems have a sense of fatalism to them; they write of life on the run, never expecting to be free and an awareness of their ultimate doom. "Even going to jail doesn't seem to be an option," Ackerman said. "I think they realize that they're eventually going to be killed by the police." Clyde had been in prison before, from 1930 to 1932. He had a brief period of escape after Bonnie smuggled a gun to him but was quickly recaptured. According to a memoir by Blanche Caldwell Barrow, the wife of Clyde's brother Buck, Clyde cut off two of his toes while in Texas' Eastham Prison Farm because he desperately wanted to get out of hard labor there. He didn't want to go back to prison. Bonnie didn't want to go to prison either, Ackerman said, which is why she never turned herself in even though it was thought that police might be willing to go easy on her. During the Great Depression, the duo were almost folk heroes — sort of like Robin Hood and Maid Marian, Ackerman said. Indeed, Bonnie and Clyde were often glamorized, he said. Their poems help turn them into real people again and show them as doomed lovers and partners in crime. "There's an authenticity to it," Ackerman said. "It has a very poignant aspect to it." When the poems go up for sale, he estimates they will sell for upward of $10,000 apiece, because Bonnie and Clyde are household names. Though Bonnie and Clyde were aware of their notoriety, their poems give a message that's far from their Hollywood image of sophisticated gangsters living life in the fast lane. Instead, they write about just trying to get by. We donte want to hurt annyone but we have to steal to eat and if its a shootout to live then thats the way it will have to bee. An earlier broadcast of this story incorrectly stated that Bonnie Parker and Clyde Barrow's rampage lasted for five years. It lasted two years.